As one of my New Years resolutions was to take more overseas fishing trips abroad, what better place to start than with a week in Cape Cod chasing Striped Bass. Up until now my only saltwater fly fishing experiences were the odd half day trip on the South coast or a weekend up in Scotland, the only fish to show for these efforts being a solitary bass from the West coast of Scotland earlier in the year. I took the trip out to Cape Cod with Austen at UKSaltwaterflies. He organised the flights, accommodation and guides. The flight in to Boston is short enough to warrant 'only' spending a week in the US. The six hour flight to Boston meant we landed around lunchtime. We were staying in Harwich, which is on the southern coast of Cape Cod. The drive from Boston was only two hours. We hired two cars for our group of six, and consequently split in to two groups of three. This allowed the groups to do separate trips and explore different areas. In order to respect our guides, and other fishermen we spoke to on car parks and on beaches, I'll be intentionally vague with the names of the marks that we fished. However, if you decide to visit the Cape, you'll discover that locals are very forward with advice and tips on where to go; they are amongst the friendliest fishermen I've experienced and contrast dramatically to some of the secret squirrels in the UK. 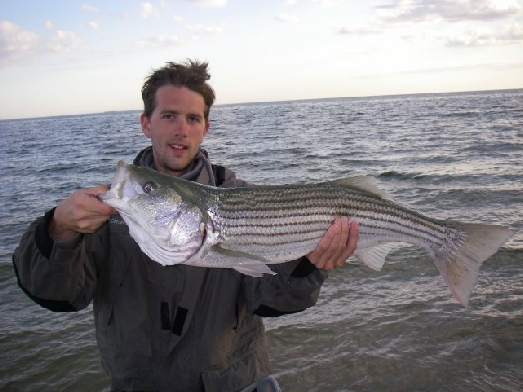 I had 35 Striped Bass and a Bluefish during the week including a 30" and a 31" Bass. Bass tend to be measured in length from nose to tail rather than by weight as this is much quicker and easier when the fish is out of the water. The minimum length of fish that can be killed is 28", and these are referred to as keepers. During the week we took one keeper for dinner and the five of us had a delicious meal from it. There is a limit of taking two keepers per day per person but the majority of fish are returned, especially by fly anglers. 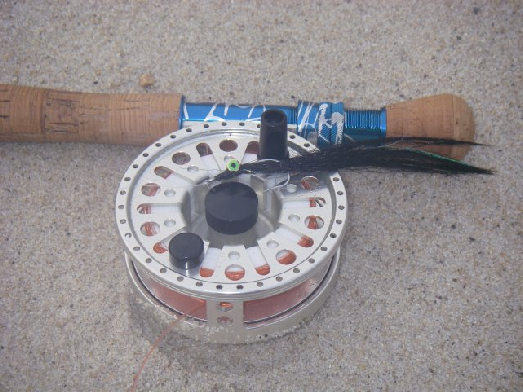 Other popular methods employed by anglers on the Cape are bait fishing and plugging. The majority of the boats that scatter the shore use bait out in the deeper water. Cape Cod has a great variety of fishing marks available. 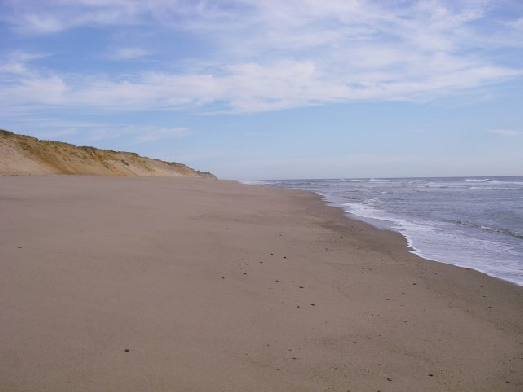 Within half an hour you can drive to steep beaches, drop-offs, sandbars, channels, harbours and flats. Each of these have their various, and individual, hazards. Within just 24 hours of arriving we realised this. Fishing a channel that held a lot of schoolies, we had walked a long way out across the flats. Over 500 metres from the beach, heavy fog rolled in from and it grew increasingly dark. Seeing much more than 15 feet in front of us became impossible and with the fish in front of us in large numbers the temptation to stay out past dark was great. Flats can be very disorientating; without any form of gradient it is difficult to comprehend which way you are facing. Fortunately, however, we were prepared. Prior to leaving, using a compass, we had checked the direction we would need to walk to get back to safety. With an advancing tide and poor visibility it makes sense to have an escape route back to the safety of the shore. Just a few seconds of careful planning can help to prevent potential problems. It meant that we safely reached the beach. So despite ending up further away than planned, walking along the beach attempting to find our car park was undoubtedly preferable to wandering the flats in search of the beach! There is some excellent wildlife visible whilst fishing in the Cape. During the week I was fishing thirty feet away from two feeding seals. Unfortunately they probably stopped the fish feeding but it was a pleasure to be fishing amongst such great fish catching creatures. On the last morning we had an Osprey take a bass from in front of our eyes on the river before soaring back to the trees with its prize firmly held between its feet. Whilst standing and fishing we were treated to some fantastic, and at times bizarre, marine life. 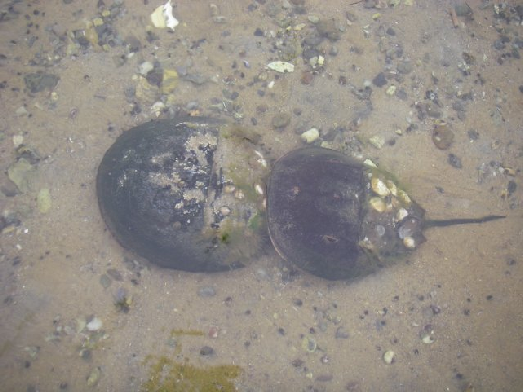 I had lobsters scuttle past my feet, crabs attack my fly and hook themselves, and the large horseshoe crabs mount my feet and each other (pictured below). One of the highlights of the trip for me was the ability to try plugging in saltwater for the first time. We were guided by Tony Stetzko who is one of the finest and most respected anglers on the Cape. The area we had planned to go to had been closed the day before due to nesting birds so we had to go elsewhere. Fortunately Tony had an array of marks in his arsenal and we fished a lovely calm bay off an inlet. We fished from 6.30 until midnight and I ended up with five fish including one at 30". I learnt a lot that night about the importance of colours during dark. I was getting a lot of knocks from fish at the end of the retrieve but none were connecting properly with the plug. Tony changed me from a plug with a silver back to one with a gold back and then immediately had two fish in two casts. That is the advantage of having a guide for some of the trip, small changes can produce big results. On the way back driving along the beach we fished some deep holes in search of a big fish but after trying two or three places we gave up and concluded the big fish either weren't home or weren't hungry! Whilst wading through the water under the cover of darkness we saw our footsteps giving off a fluorescent light. The fluorescence was caused by algae in the water; if nothing else it was novel and something I hadn't come across in the UK. Except for carp fishing, I never fish during dark so this was a good experience, although at times slightly frightening when large fish crash a foot away from where you are standing in waist deep water. When the guide mentions seeing Great Whites in the area recently then it's definitely time to seek shallower water! On the penultimate night I stood in a channel that ran parallel to the beach and the water around me turned black. Closer inspection revealed an immense shoal of baitfish known as bunker. I flicked my fly in to the shoal and straight away hooked one of about a pound in weight. These shoals are often chased by bluefish and within seconds my hooked fish was being chased around the surface by a large bluefish. Both fish were jumping out the water at the same time whilst the bluefish was slashing at the bunker. Ten seconds later the line tightened and the reel started screaming. I was taken on to my backing and just as the backing went through the tip ring the bluefish bit through the line. This can happen when the fish turns and the line goes across the mouth, slicing through the line. About half an hour later I hooked in to another solid fish and the first run took me about 100 yards on to the backing. It was a lightning quick take and a thunderous run. The fight lasted over ten minutes and the bluefish was within spitting distance when it turned and the hook came out of the top lip. I ran up the beach and hit the rod on the sand hard half a dozen times. It probably didn't do the rod any good but it relieved the stress! Dan, who was fishing next to me had come to watch and he estimated the fish to be over ten pounds. Losing that fish gave me the bluefish bug and I spent the rest of the evening trying to hook another one but to no avail. To land a good ratio of bluefish you need to fish with a trace to prevent their teeth from cutting the line. The downside of using the trace is that it seems to put the bass off the fly. Talk about a Catch 22 situation! Of course, a fishing holiday wouldn't be complete without a trip to a fishing shop or three! When I was there the exchange rates were pretty much $2 to the £ which made things exceptionally cheap. There are two main fishing shops on the Cape - Goose Hummock and Orvis. Goose Hummock is huge and caters for all forms of fishing. Orvis is dedicated only to fly fishing but carries some nice luggage which I wisely invested in! Hidden away is a Closeout Shop which stocks a lot of very cheap gear such as waders, fly tying vices, rods, reels, leaders, fly lines and clothing. It is well worth a trip if you are near Eastham and you can get some superb deals in there. To fish seriously in Cape Cod you will need to be fairly fit. A lot of the good marks involve a walk from the car. We walked 6 or 7 miles a day in waders, jumpers,wading jackets, waistcoats and rucksacks. We were out in June and the weather we had was very mixed. Some days we had glorious sunshine and others we had thunder and lightning. For most of the time we had a fairly stiff breeze so your casting needs to be at a level that allows you to cast heavy flies in to the wind as well as being able to cast with a side wind. The changing weather means you need to take adequate clothing for any eventuality. Being stuck in torrential rain with the car 2 miles away is a bad idea, so a rucksack that can be left on the beach behind where you are fishing can come in handy. I used a 9 weight rod all week. This was not my ideal choice but it was the only rod that would fit in my suitcase. 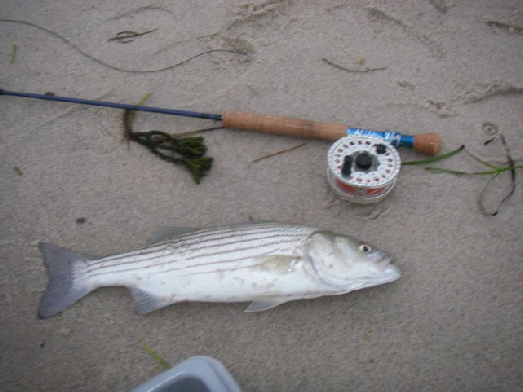 A 6 or 7 weight rod would have been nice for the schoolies on the flats and in the river. An 8 or 9 weight rod would be a good allround choice for all the situations on the Cape. A heavier rod may come in handy should you take a boat out to fish deeper water although most guides have tackle you can use. A hard stripping basket is a necessity especially when wading. The majority of the fishing was done with sinking lines or intermediates and without the stripping basket it would be near impossible to achieve any distance with the casting. A headtorch can also be handy during dark. If at all possible use one with a coloured lens to dim the light. I only used two flies all week. During the day I used a sandeel (a few different colour combinations but the same basic pattern) and a black fly for the night time to create a nice solid silhouette. There is no need to carry around boxes and boxes of flies. On the subject of flies, it is not cheap to buy flies in the US - most flies are between $5-$6 each, so if you tie your own it can save you some money. If you are fishing hard for a week as we did then you will more than likely sustain injuries of some kind on your hands. When we were fishing waist deep in water, we grabbed the leader to get the fish under control and if the fish decided to make a last ditch effort at escaping then the line can cut your fingers. I made that mistake three times and managed three cuts on my fingers. The cuts didn't heal all week; the moral of the story is to remember to take plasters with you just in case! Some people wear stripping gloves as well to prevent the fly line from chaffing the skin but these aren't necessary.